Project Description: The Luzerne County Emergency Operations Plan was adopted in June 2011 and is written on the all-hazards concept. It provides a set of procedures that the Luzerne County Emergency Management Agency will do for any type of emergency that exists or can affect the County. The County does not have a specific flood operations plan, just as there is not a specific tornado, hazardous materials or winter weather emergency plan. With respect to Susquehanna River flooding, the Emergency Operations Center (EOC) would generally activate at a river level of 20 feet when the levels are anticipated to exceed the 25 feet level. This would prompt minimal EOC staffing. When it is anticipated that the river levels would exceed 30 feet the EOC would have full staffing for the duration of the event. Close the pedestrian opening in the floodwall along Riverside Drive in south Wilkes-Barre. The closure stop logs are stored at the adjacent Old River Road Pump Station. A stop log closure is in place across an existing abandoned rail road opening in Exeter Borough, adjacent to Route 92. Check the closure to ensure its continued structural integrity and that the tie-downs are properly secured. The Authority has 9,000 sandbags in inventory. Coordinate with an existing sand quarry to deliver sufficient material to immediately fill 2,000 sand bags ready for mobilization to various sites. Remove existing electrical lighting wallpacks, globes and ballasts from lights under the Market Street and Pierce Street Bridges. Throw light circuit breakers before river level reaches pole bases. Assemble the post and panel closure across an existing abandoned rail road opening off Swetland Lane in Wyoming. Assemble the Market Street Bridge post and panel closure approximately 8 hours in advance of a 34 feet projected river crest. This includes the installation of closures on both the Wilkes-Barre and Kingston sides. 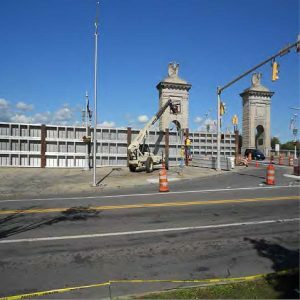 The attached left photo depicts the installation of the closure panels on the Wilkes-Barre side along River Street. At a projected 30 feet river crest, assemble the stop log closure across an existing Canadian Pacific Rail Road opening adjacent to the Solomon Creek Pump Station in Hanover Township. Call CP as early as possible and inform them of the closure installation and shutting down of the rail line. Inform CP of the possible need to sand bag the Black Diamond Railroad Bridge openings at both the Riverside Drive and Kirby Park ends. These closures are in the freeboard area of the levee and do not need to be bagged unless necessary. Assemble the Luzerne County Courthouse closure after completion of the Market Street Bridge closure installation and prior to a river gauge reading of 33 feet. The Wilkern Street sandbag closure in Exeter Borough is also in the freeboard area of the levee and does not need to be assembled until a gauge reading of at least 38 feet. Assemble the Route 11 (Wyoming Avenue) post and panel closure in Edwardsville at a river gauge reading of 34 feet. Edwardsville Borough is informed that Route 11 will begin to become inundated in front of Mark Plaza at a river elevation of 33.5 feet. The attached right photo depicts the installation of the closure panels on Route 11 in Edwardsville. The Authority has 13 pump stations that contain 39 vertical, deep well, impeller-type pumps in our flood control system. The pump stations are included in the project in order to reduce the risk of flooding at the low areas behind the levees and floodwalls in the boroughs of Kingston, Edwardsville and Plymouth, the City of Wilkes-Barre and Hanover Township. When the river level rises to flood stage, any inland storm water is trapped on the landside of the levee. This inland storm water is routed to the stations through overland flow or interconnected sewer systems where it is pumped to the riverside of the levee. This action reduces the risk of inland flooding from localized storm events during high river stages. At a river elevation of 10 feet, the Church Street (Kingston) and Delaney Street (Hanover Township) Pump Stations are activated. At a river elevation of 12 feet, D&H, Horton Street and Old River Road Pump Stations (Wilkes-Barre) are activated. Woodward Pump Station (Edwardsville) is activated. At a river elevation of 14 feet, Ross Street Pump Station (Wilkes-Barre) is activated. At a river elevation of 15 feet, Loveland Pump Station (Kingston) is activated. At a river elevation of 18 feet, Solomon Creek Pump Station (Hanover Township), Brown Creek and Wadham Creek Pump Stations (Plymouth Borough) are activated. At a river elevation of 19 feet, Market Street and Union Street Pump Stations (Wilkes-Barre) are activated. Funding Stream(s): In accordance with the Pennsylvania Municipal Authorities Act, the Authority assesses an annual “levee fee” on all residential, commercial, industrial and tax-exempt properties located within the 1972 Agnes floodplain, along the Susquehanna River in the Wyoming Valley. The fees collected cover the costs of the Authority to operate and maintain the project. The Authority receives no other revenue assistance from the Federal, Commonwealth, County or other local governments. The Authority’s annual budget to maintain and operate the project is approximately $1.5 million dollars. 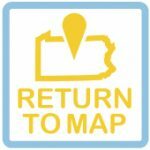 When a declaration of a major disaster or emergency is made for Luzerne County, the Authority and the County of Luzerne may be eligible for reimbursement for costs associated with the disaster response and recovery. 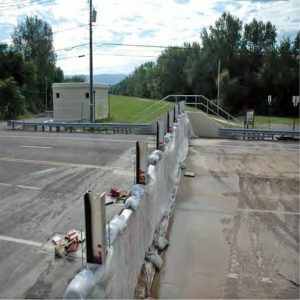 The Wyoming Valley Flood Risk Management Project is active in the United States Army Corps of Engineers (USACE) Rehabilitation and Inspection Program (RIP) and is eligible for PL 84-99 rehabilitation assistance. Public Law 84-99 is a Federal law that provides the USACE the legal authority to conduct emergency preparation, response, and recovery activities and to supplement local efforts in the repair of flood damage reduction projects that are damaged by floods.